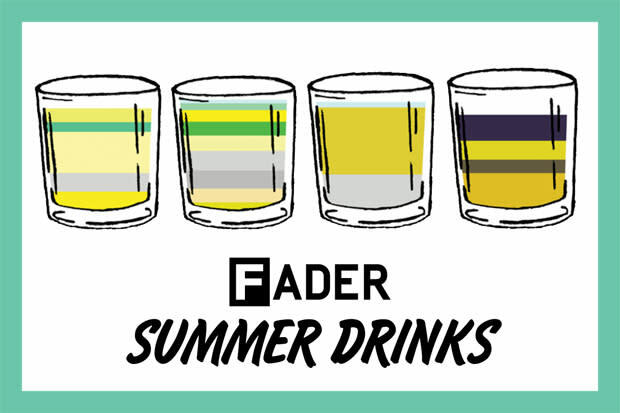 For FADER #74, we hit up bartenders in Paris, Amsterdam, San Francisco and New York City for their best bright and boozy summer cocktails. They mixed up four easy breezy recipes full of the lime, mint, bubbles and berries hot nights beg for. Click through to make them all. Refreshment is a virtue for father and son proprietors Massimo and Massimo Scoditti. The Puglia, Italy natives bring their sea-breezy fare of seafood pastas and Campari cocktails to their new downtown location. At Brio, the summer wisdom is that the right mix of sweetness, bubbles and alcohol—the fixings of the traditional Italian drink Sgroppino—is the freshest way to hydrate. Directions: Pour the vodka, limoncello and prosecco over ice in a shaker, let chill. Add the lemon sorbet and then, using the stem of a cocktail spoon, gently but firmly move the concoction up and down to break up the ice and create a little froth. 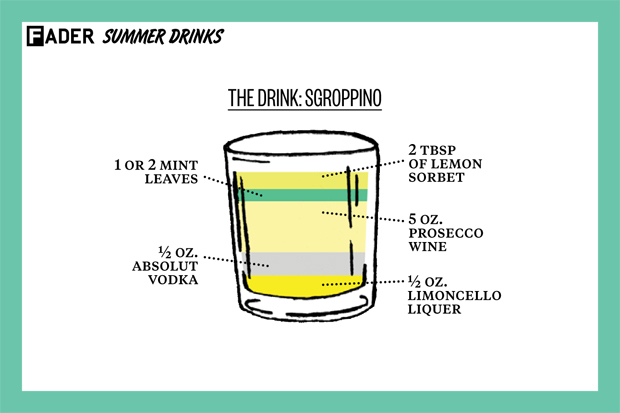 Pour into a champagne flute and top with a sprig of mint. Taquerias in Paris are an anomaly, but that isn’t the only reason why Candelaria stands out. In addition to favoring carnitas over croissants, it also offers some mind-blowing cocktails for the wine-bar weary. Josh Fontaine and Carina Tsou (who is also a partial owner of Candelaria with her husband Adam Tsou) lend a culinary eye to the cocktail menu, making many of their own syrups like sangrita (a tomato-based, spicy tequila accompaniment), ginger beer, house made orgeat (bitter almond) syrup and grenadine and mixing them with a sophisticated stock of fine tequilas, mezcals and piscos. Directions: Muddle the bell pepper, pineapple, simple syrup and a pinch of salt in shaker tin. Add other ingredients. Shake and double strain into martini glass. No garnish. While it’s pretty easy to find a good beer on tap, it’s less common to find a bar that serves good beer cocktails. Which is why William Bostwick and Jessi Rymill (the buds of home brewing) have taken matters into their own hands. The dedicated cooks have dumped everything from peppercorns and pumpkins, raisins and grapefruits into their homebrew recipes—to great result. But what to do when you tire of your brew? Mix in a smokey tequila! It’s a cocktail that delivers the complexity of a margarita without the hangover-courting sweetness. 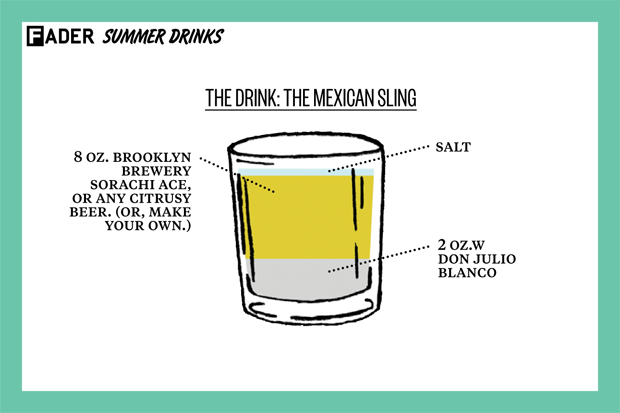 Directions: Salt the rim of an old-fashioned glass or tumbler. Pour in the beer, then the tequila. 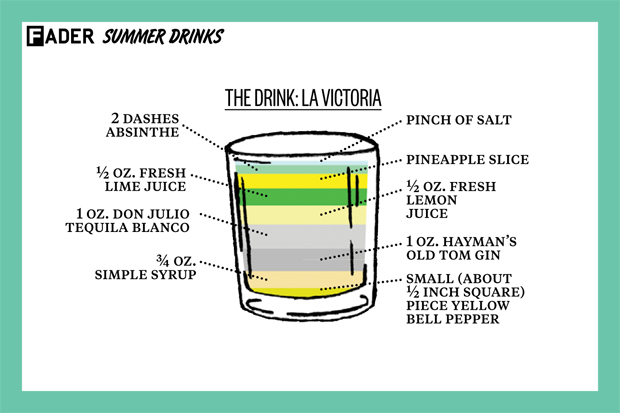 Garnish with a lime wedge, if you’re fancy. a roast chestnut mint julep.They even go as far as teaching cocktail workshops, which cover the most common mixing techniques and terminology. In short, Vesper will school anyone who thinks Amsterdam is just weed and beer. Directions: Muddle the blackberries and honey in a snifter. 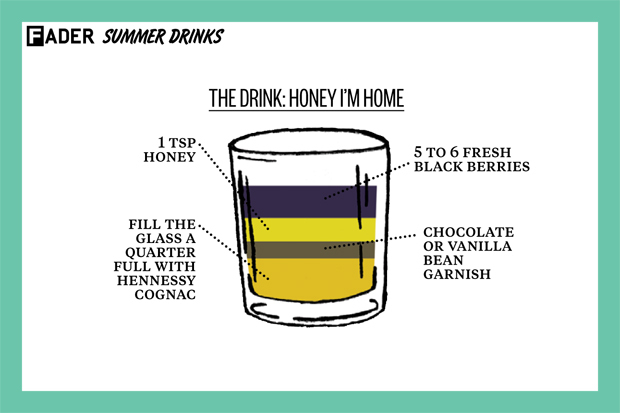 Pour in the Hennessy Cognac, and garnish with a vanilla bean or shaved chocolate.